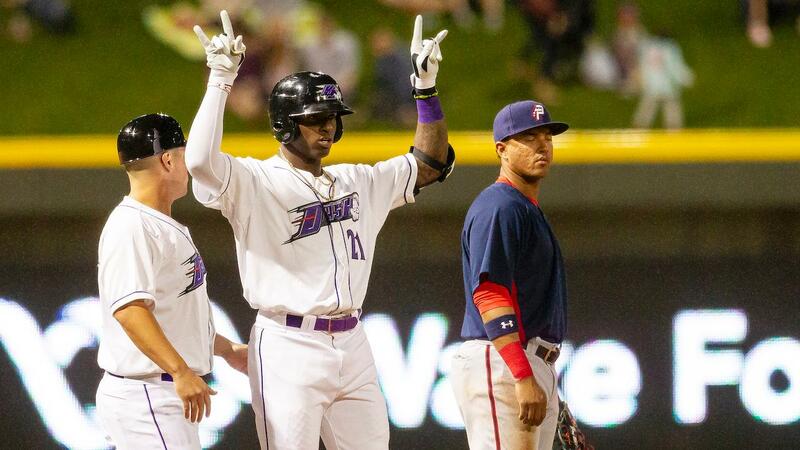 WINSTON-SALEM, N.C. (April 11, 2019) - Luis Robert continued his incredible start to the season by hitting a go-ahead, two-run homer to lead the Winston-Salem Dash to an 8-6 victory over the Potomac Nationals on Thursday in the home opener of their 10th anniversary season at BB&T Ballpark. With the score knotted at six in the bottom of the eighth, it was time for Robert's heroics. After a Carlos Perez single to lead off the inning against Hayden Howard (0-1), Robert crushed a two-run home run to center to give the Dash the lead for good. The mammoth blast was Robert's fifth of the season in just seven games played. Overall, the Dash (4-4) offense was clicking on all cylinders, as they registered a season-high 16 hits in front of a crowd of 5,991 fans. Potomac (3-5) took a 3-0 lead in the top of the first, but the Dash struck back quickly. Robert led off the inning by scorching a ball that deflected off the glove of Potomac's third baseman Anderson Franco. A Jameson Fisher double to left-center advanced Robert to third before he came home on a groundout by Nick Madrigal. Following the groundout by Madrigal, Potomac starter Grant Borne was removed from the game and replaced by Andrew Lee. The Dash cotinued the offensive flurry against Lee, as Tyler Frost smashed a double to right field to cut the Potomac lead to 3-2. With two outs in the inning, Craig Dedelow crushed a run-scoring triple to deep-center, knotting the game at three. Winston-Salem took its first lead of the game in the bottom of the second, as Madrigal notched his second RBI of the game with a sharp single to center. After Potomac tied the game on a sacrifice fly in the top half of the third, Winston-Salem regained the lead in the bottom of the frame. Zach Remillard led off the inning by ripping a double to left-center, and later, Yeyson Yrizarri brought Remillard home with an RBI groundout to put the Dash ahead 5-4. With Winston-Salem clinging to a one-run lead in the bottom of the sixth, Robert smashed a triple into left-center. He later came home to make it 6-4 on a wild pitch from Potomac's Hayden Howard. While the offense rolled, John Parke battled after a tumultuous first inning. Parke finished the day allowing just two earned runs on five hits in six innings of work. However, the Nationals did not go quietly. In the top of the seventh, Jackson Reetz laced a two-run double down the left field line to tie the game up at six, setting up Robert's moonshot. Luis Ledo (2-0) earned the win for the Dash, closing out the ballgame with two scoreless inning of relief. Winston-Salem continues its home series against Potomac on Friday at 7 p.m. Right-hander Blake Battenfield (0-0, 1.50 ERA) will take the bump for the Dash. He will square off with fellow right-hander Jackson Tetreault (1-0, 1.80 ERA) for Potomac. First pitch is set for 7 p.m., and fans can catch all the action on wsdash.com/broadcast, MiLB.tv and the TuneIn Radio App. Pregame coverage begins at 6:45 p.m. Following Friday's game, there will be a postgame fireworks display, presented by PTI. A Food Truck Festival and a Chick-fil-A Four Pack Night are on deck for Saturday, while a Rayados Day (presented by Univision) and a Craft Fair are on tap for Sunday. For tickets and more information, call the Dash at (336) 714-2287 or visit wsdash.com.